Everyone who knows me, knows how much I LOVE my furbabies. They definitely make my simply sweet home a LOT sweeter, and because they bring so much joy to MY life, I try my best to make sure they have a good life. One way I do this is my making sure they have delicious and nutritious foods and treats, and then I also make sure they are always comfortable and happy in our home. First let’s talk cat food. 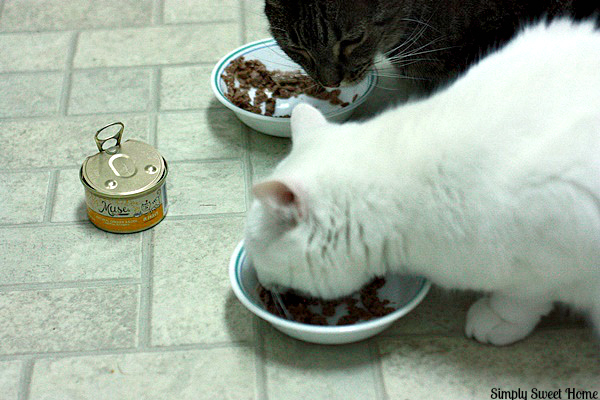 Recently I bought some Purina Muse® Natural Cat Food for Rebel and Sugar. When I learned about the Muse® line, I was happy to try it, because the products are made with natural ingredients; that is to say, that all recipes are made with real fish or poultry, are grain free, and the products contain no artificial flavors, colors or preservatives. 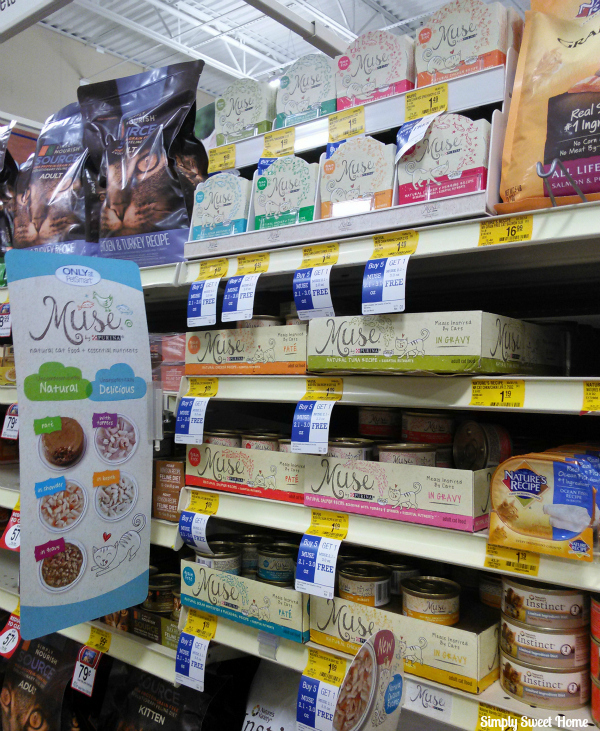 I shopped for Purina Muse® Natural Cat Food at PetSmart. It is located on the healthy and special diet cat food aisle. Coupon Alert! This is a great time to try this product, because PetSmart has this Buy 3, Get 3 Free Coupon for all Purina Muse® products! To find it, just look for the colorful and inviting packaging, and the special signage shown above. A number of products are available, including Chowder, in Broth, with Toppers, in Gravy and Paté. 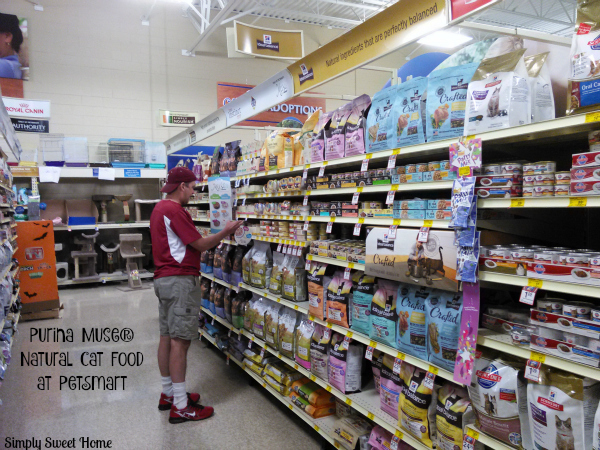 When selecting cat foods, I always try to choose flavors I know my cats love. Purina Muse® comes in 30 delicious recipes and 24 grain-free varieties. 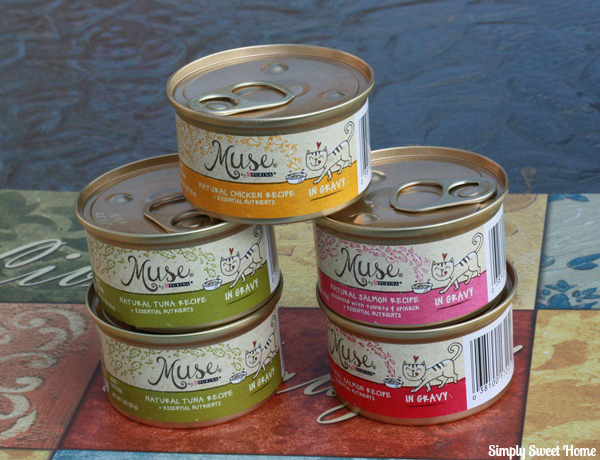 For my cats, I purchased several cans of the salmon, tuna, and chicken flavored varieties in the gravy and pate recipes. 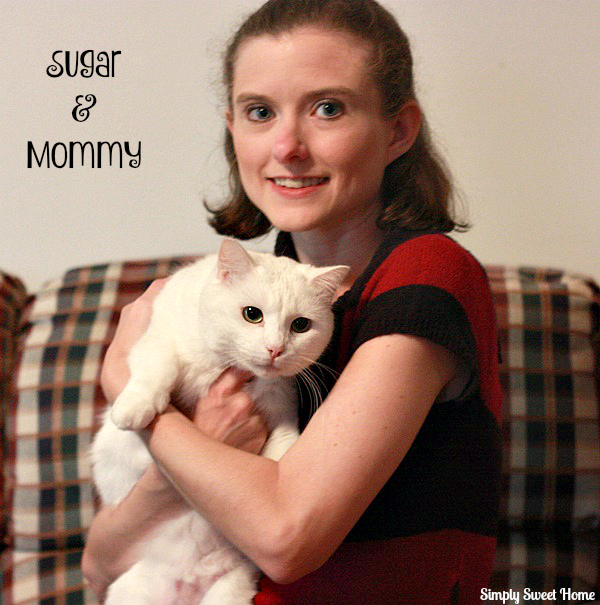 As I got ready to serve the first can of Natural Chicken Recipe, I had no doubt that Sugar would love it. (She loves just about everything I’ve ever given her!) As I suspected, she dove in and immediately started eating! Then there’s Rebel. 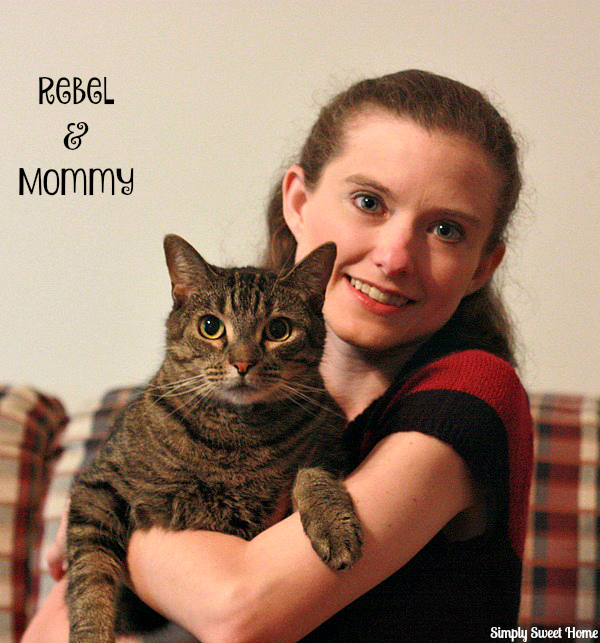 Rebel is actually the main reason why I’ve been looking for alternative wet cat foods. He’s a lot more finicky than Sugar is, and he is the type of cat that will sniff food and just walk away with out trying it, and with some foods he will eat the gravy or broth and leave the meat behind. In fact, I actually bought the Purina Muse® in Gravy, because I thought the gravy or broth recipes would be Rebel’s favorite. I was thrilled when I set down Rebel’s bowl of Chicken Recipe, and he dove in to it, just like Sugar did! “Yay! It’s a hit!” I thought. 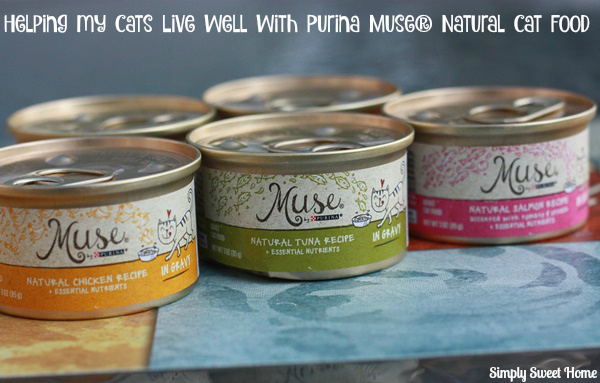 And the best part about Muse® is that it offers we cat parents a healthy cat food that also tastes good to our kitty babies! 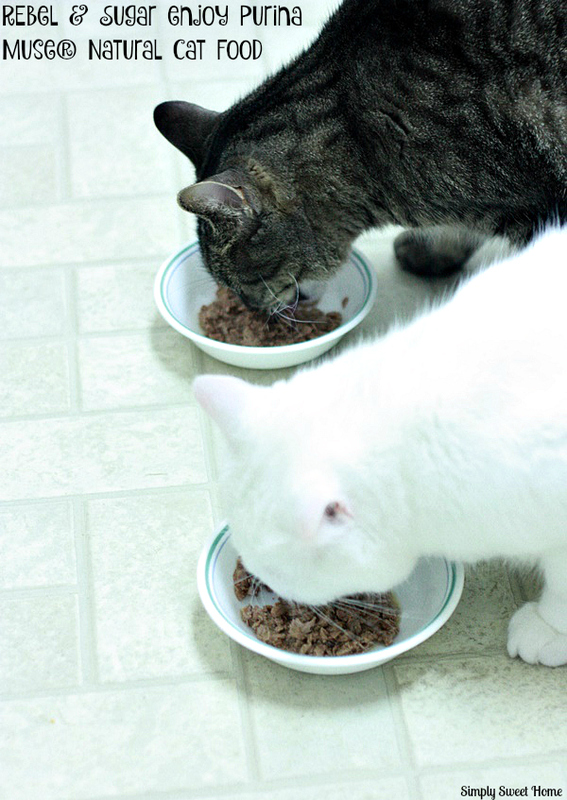 If your kitty babies are like mine, they will definitely clean their plates! How else can you help your cats to live well? At the beginning of this post, I said that apart from serving my cats good food, I always try to make sure they are happy and comfortable. I do this my making my home their home! Just like people, cats need areas where they can rest and play. And if you don’t provide them with these areas, they will choose areas for themselves (and often, they choose areas where you may not want them to be). For this reason, we have a “pet room” in our house where the cats can play, rest, and do their business, and then I also have a few places throughout the house where they can sit or lay and still be among the people. 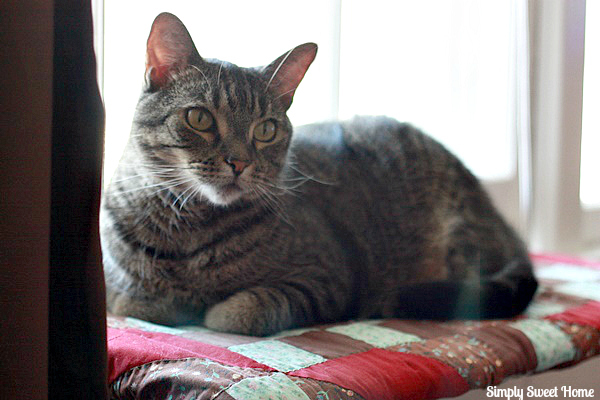 Here are some things that we have in our home, which I feel are real assets for cat owners. Window seats. Cats LOVE to look out the window! We have one of these in our living room, and then we also have a small bookshelf in our cat room that serves as a window seat. Cat Beds. 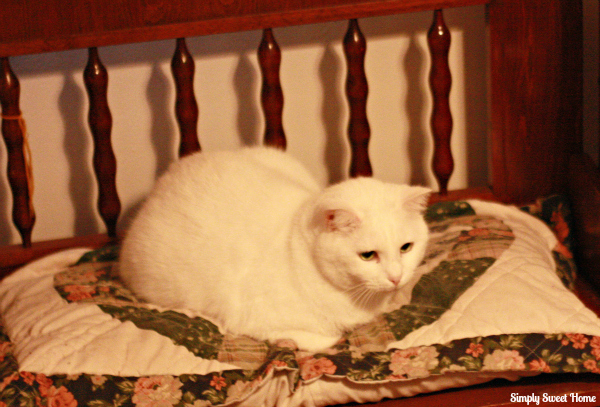 Although our cats sometimes sleep on our bed or other human furniture, we also have beds for them, which they use quite often. Cat Trees. Cat trees are an awesome investment. These are especially great to have when you have kittens, because they play on them a lot! But they are also great for adult cats because they give the cats place to jump, and they allow them to be up high, which is something they instinctively love. And most of these have high scratch posts, which is a must if you have a long cat like I do! Scratchers. We’ve used a variety of scratchers, including the cardboard scratchers, sisal rope posts, and carpeted scratchers. All of these are good; you just have to try them out and see which ones your cats prefer. Low and high seating. Cats like to have a variety of places where they can sit. Cat expert Jackson Galaxy says that some cats are “bush dwellers” while others are “tree dwellers.” For this reason, it is a good idea to have a variety places your cat can go, in order to accommodate their needs. Cat trees, the window seats, and wall shelves are great for tree dwelling cats. Cat tunnels and cubes, as well as cat beds are good things to have for bush dwelling cats. You can also just place a little pillow or blanket underneath your existing furniture to give your bush dwelling cat a safe place to hide. Natural has never been so delicious. Put Muse to the test with their clean plate guarantee. Find out more about Muse® products by visiting their website. Then come back and tell us something you think your cats would love.